"The mural is a visual history lesson not found in history books. People, especially the younger generation, can really relate to this..."
Be sure to watch our documentary video on "The Making of a Mural". Purchase a print of any of our murals, and help continue the program! 100% of your purchase benefits the Heritage Mural Education Program at Totts Gap Arts Institute. After the success of the “Our Town” mural, members of the Bangor Main Street Design Committee were looking for a follow up project that would have an even greater impact. In 2011, the Bangor Trust building at 15 Broadway was selected as the “canvas”. For years the west wall of the building was covered with random splashes of enamel. It needed an upgrade. Members of the design committee met with the lead artist, Jim Gloria over a period of 6 months with the guidance of a curator from the Slate Belt Heritage Center. 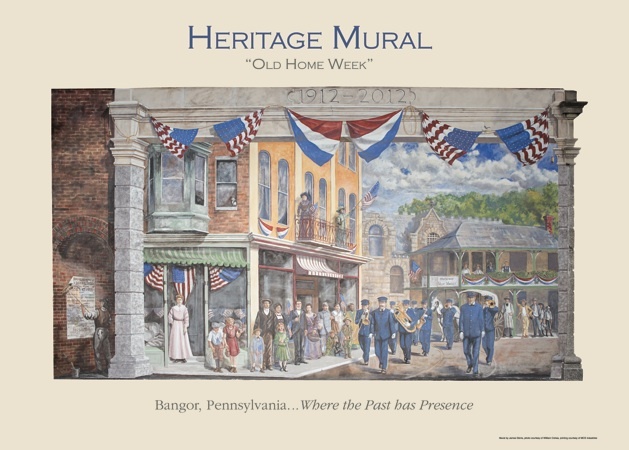 Gradually, a design emerged: The mural would celebrate the centennial of the town homecoming known as “Old Home Week”. Art students participated in free mural classes for 12 days in June of 2012, studying mural design, rendering and execution. They researched historic architecture and clothing of the period, and discussed traditional painting materials and techniques as a prelude to actively taking part in the mural painting on a daily basis over the next 2 months. Students began by preparing and priming the building wall. They then proceeded to lay out the design utilizing a grid-system of transfer, using practical math and geometry concepts in order to accurately proportion the final image. Painting began with instruction on mixing paint, color theory, and painting techniques. Students were encouraged to critically evaluate their work, engaging continually in assessment and solutions. This led to the creation of a documentary short you can see here about the making of “Old Home Week”.